Design pen on a motif of chopsticks (Hashi). A unique artistic interpretation of Japanese culture and spirituality. Chopsticks are one of the important elements in the Japan food culture. The essence of chopsticks as a tool to symbolize the eloquence and subtlety of Japan; expressed in the accent of the line and the Kanazawa foil; gradually changing from square to round. Graceful Kanazawa foil shines against a jet-black body; resulting in a beautiful production. 99 % of Japan’s gold foil is produced in Kanazawa, Ishikawa Prefecture. Craftsmen hammer until the ultra-thin foil is only 1/10,000mm thick. Great skill and experience is required. 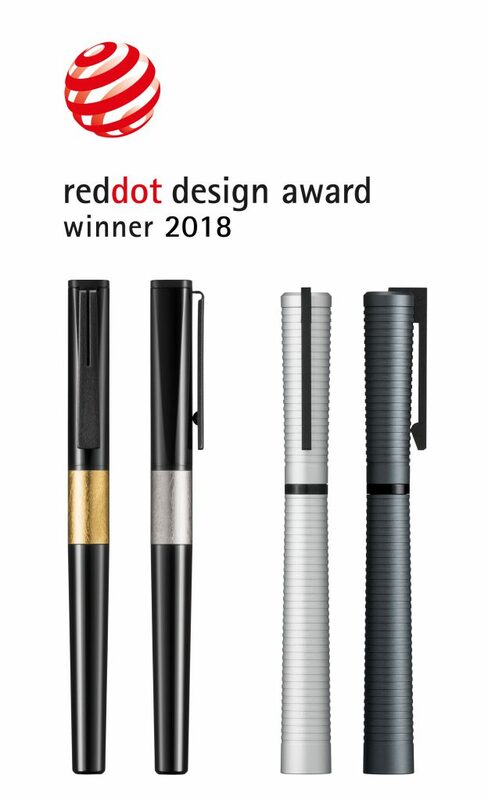 Design pen on a motif of dry landscape. A unique artistic interpretation of Japanese culture and spirituality. A dry landscape, a garden style that represents this landscape with stone and sand. Interpretation is left to the viewer and there is depth where the change in seasons and mind are of like manner. The undulation pattern is called samon; mainly expressed by the water flow. The uneven surface for a feeling of Japanese-style beauty; the appearance of independence is dressed in dignified tranquility. The surface irregularities are created by carefully cutting aluminum. This precise processing creates architectural style beauty.